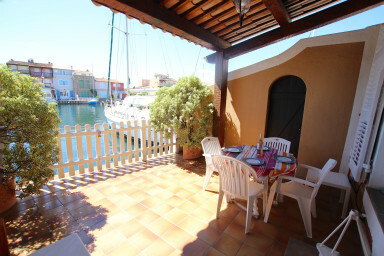 A lovely typical house perfect for a holiday at sea with ease ! Pretty typical 2-bedroom house with two nice terraces both West and East oriented . This house has got a a terrace surrounded by plants on the street side and a terrace with a barrier and a very beautiful view on the canal. On the ground floor, a living-room and a separate kitchen. On the 1st floor, a bedroom with a large bed on the canal side, a bedroom with 2 single beds on the street side and a bathroom. A 16m x 4,20m mooring. A typical house with much charm only 5 minute-away from the beach by walk.